It was a lazy Sunday which was extremely chill, on top I was on high having met fellow bloggers and then a passion that was rekindled again. I meant after eating those yummy muffins that Divya gave us, I am sure anybody will be. For lunch I made a new variety of mutton curry and fry though on hind sight find it funny that I actually didn’t click pictures of them. 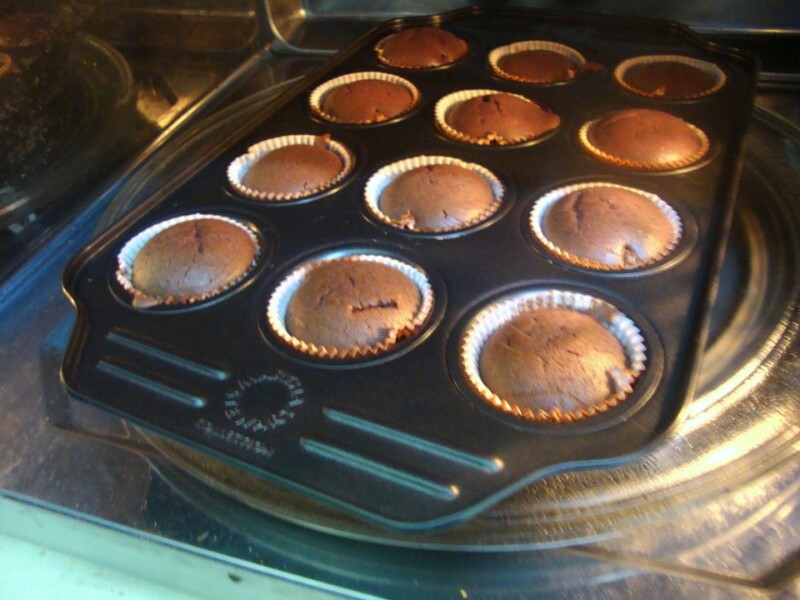 Evening when Konda said she bored, that just gave me a perfect reason to rush out to kitchen to make some more muffins. Well no reasons but then you don’t really need a reason right! She was all excited that I promised she can do it all. We proceeded with whatever we had on hand. I didn’t have a banana to bake those Banana Muffin again. Though I had half a tin of condensed milk still. I didn’t have a soda. I decided I was just going to add whatever I have on hand and pray it will get done well. Meanwhile the boys realized that their sister was not around and came to check on us. Guess what I had the whole family in my small hole that I call a kitchen. It was a chaos with all three of them wanting to do something. 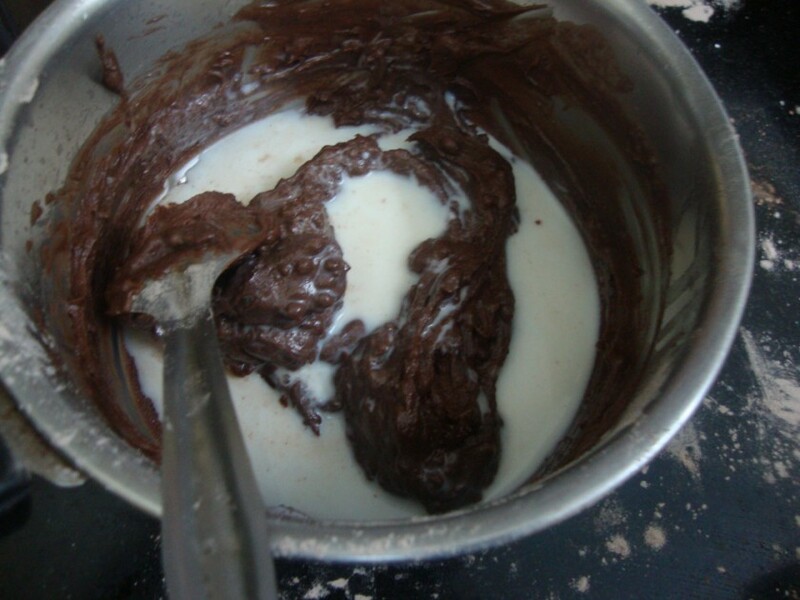 Well finally I managed to get the boys stand on the side, while Konda mixed in the batter. They were so impatient and when it started smelling great, I could see Konda getting so excited. 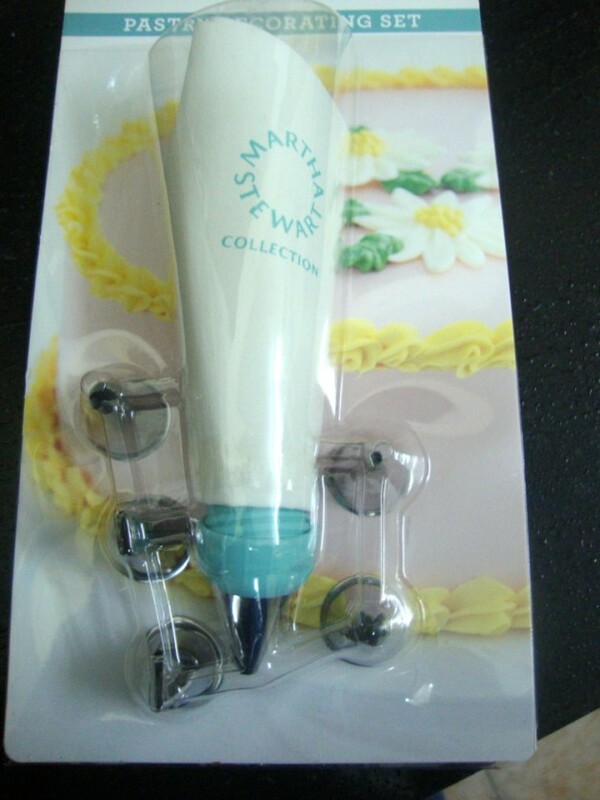 I also wanted to make some frosting as I had bought a piping bag from SFO. Can you believe the nozzles wouldn’t actually go through the opening or was I wrong? Anyway I made both these Eggless Chocolate Cupcakes in Convectional mode and Microwave mode. 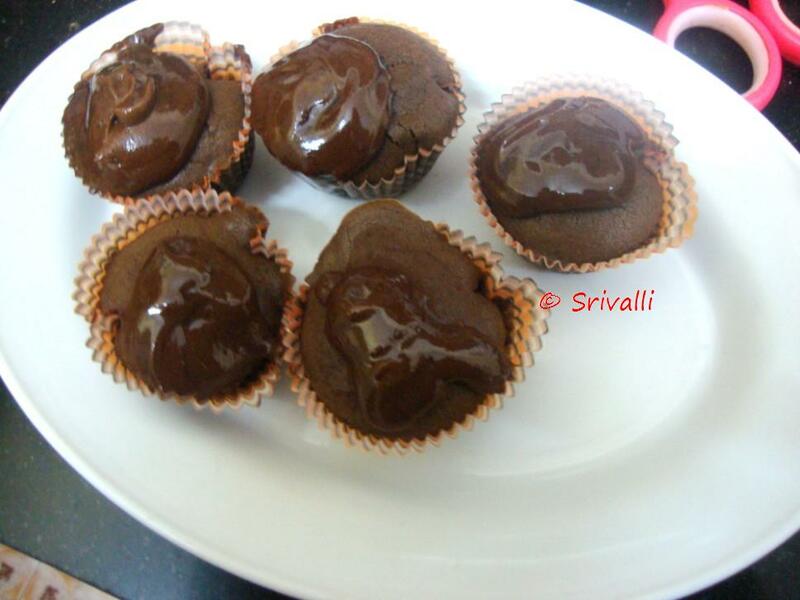 Microwave Cupcakes were so so easy, will post on that in the following post. I am so happy to say it came out very well. I can vouch because kids eat 2 of them right away and hubby dear said it was good, which is very rare for him to say on a cake! I was even more happy knowing that I don’t have to look out for condensed milk or a cola as my Eggless Black Forest Cake requires! 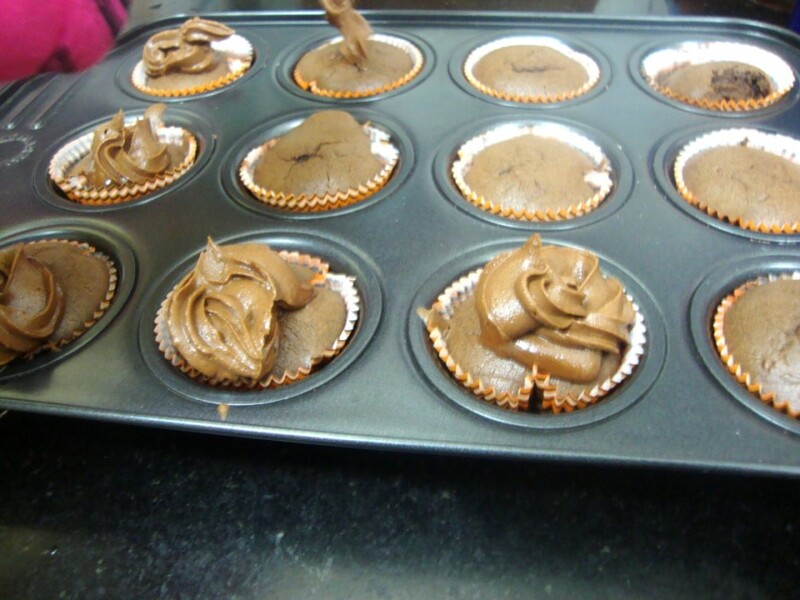 If you see that frosting is not so professional, you can say we were in a hurry!..The muffins were still hot when Konda piped in the chocolate frosting and they melted right away! 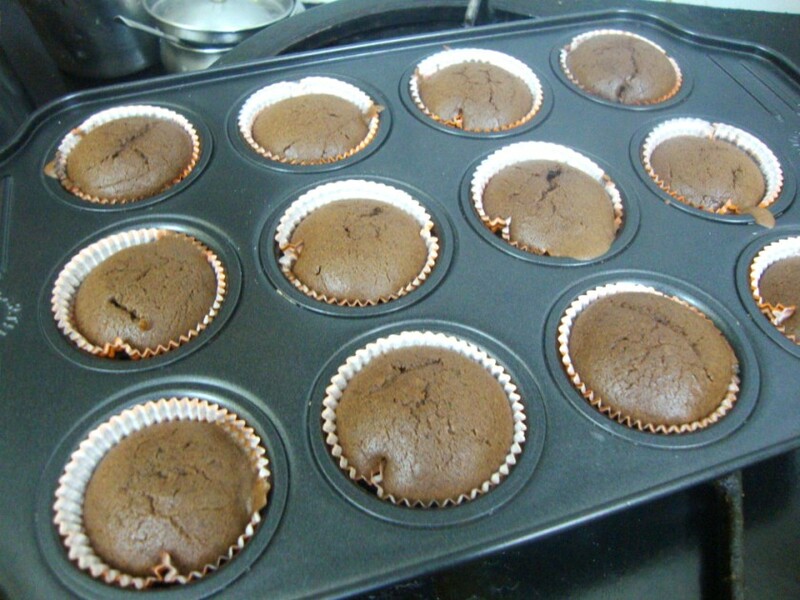 How to make an Eggless Cupcake in step by step! 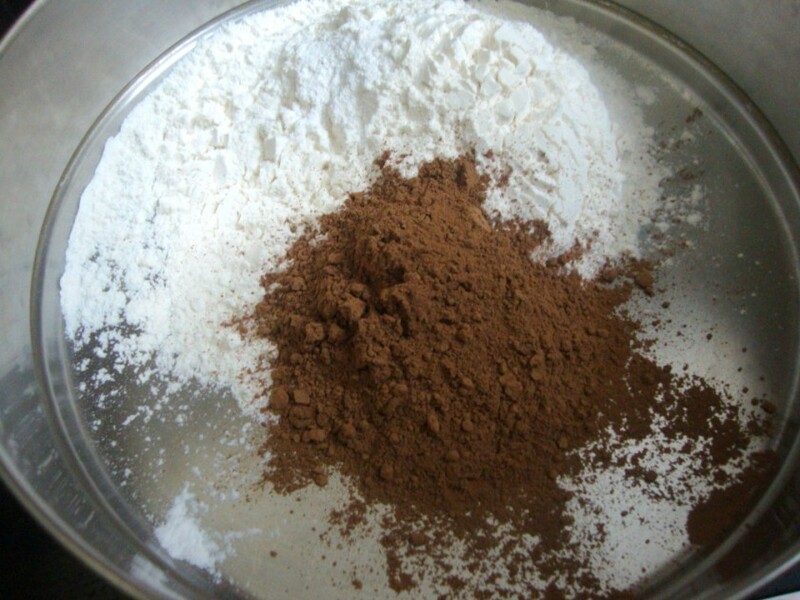 Shift the flour along with baking powder, cooking soda and cocoa powder. Then add the icing sugar to the flour. 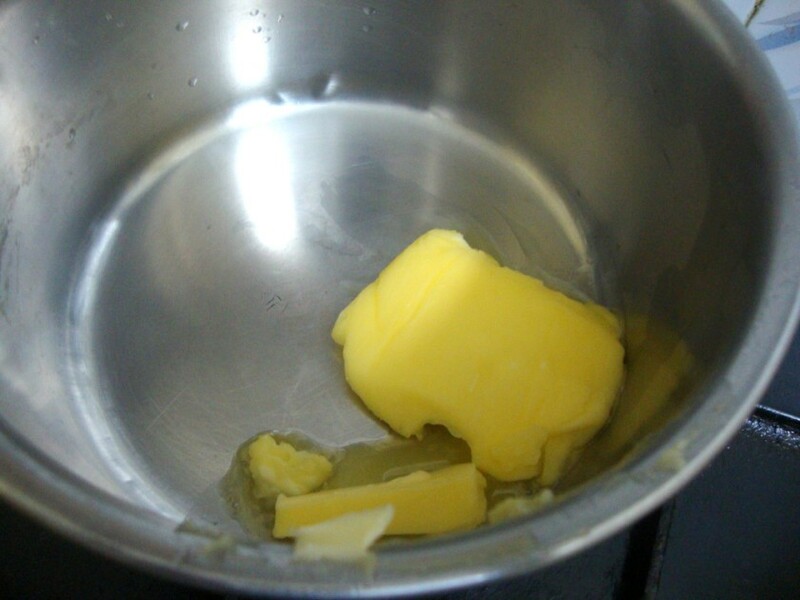 Meanwhile melt the butter in a thick bottom pan. Allow it to cool. 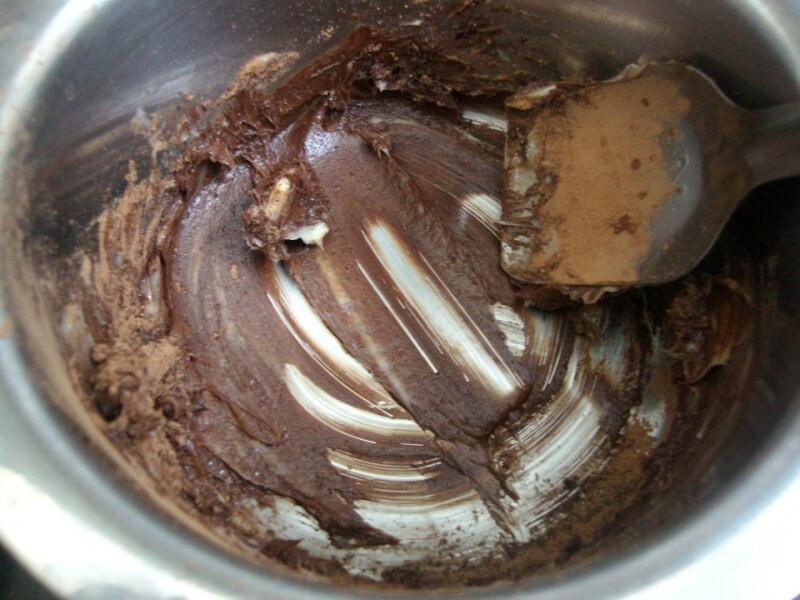 Once you are done mixing the dry ingredients, mix it to the butter. Make sure you mix everything without any lumps forming. Next goes the milk, actually you can add this ahead too, but can wait to check if the flour gets to thick. Scoop down a spoon of this batter into the lined muffin trays. Pre-heat the oven at 185*C and then bake this for 15 mins. This is at 13 mins stage. Allow it to rest or bake for another 2 mins if you still find it very soft. This is the piping bag that I got to the do the job! But I was upset with so much that get left behind..
Take the butter in a bowl, start creaming it with a spoon. 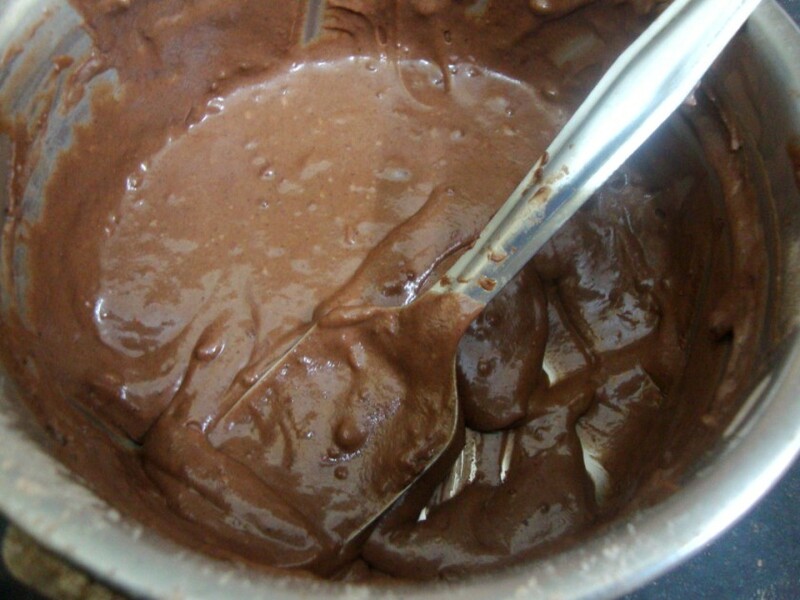 Then add the cocoa powder and continue creaming together without lumps. Then add the icing sugar to the butter and cream again. It should look something like this. You can cream further if your arms don’t ache, just keep creaming. Better if you do it with a beater but then you don’t get any excerise right! Scoop the icing into the piping bag and freeze for 10 minutes. Once the cupcakes are cooled down, pipe on the top. If you don’t wait as we didn’t, you will have the melted icing on top like this. Anyway it tasted awesome. In a thick bottom pan take the butter and melt it. Keep it aside to cool down. 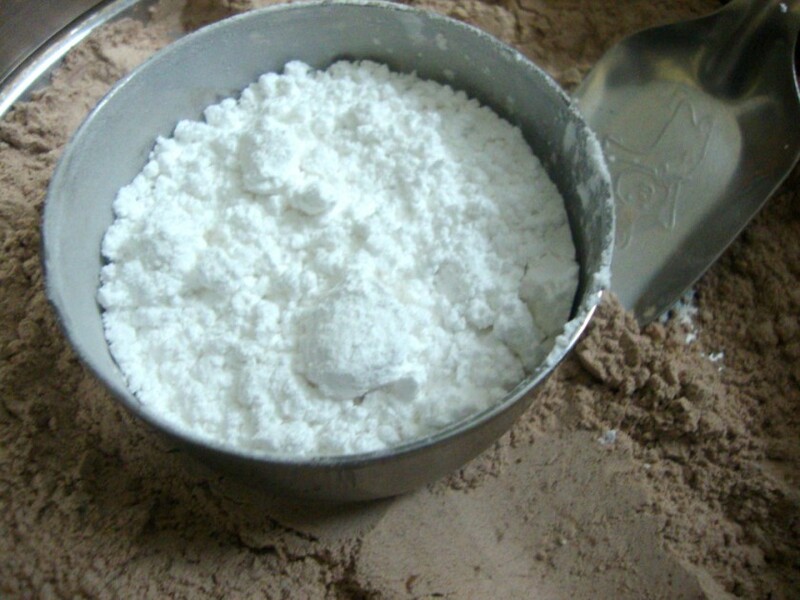 Meanwhile shift together the flour, baking powder, cooking soda, cocoa powder, icing sugar. I added the oil at this stage too. Pre heat the oven at 185* C and line the muffins with liners. The batter will be of pouring consistency. Once the oven is ready, pour a spoonful of batter into the cups and bake it at 180*C for 15 mins. Don’t open until it has completed at least 13 minutes. Check with a tooth pick or sharp knife by inserting in the middle to see if it is done. I kept it back for another 2 mins. but you can allow it to cool down on the rack. 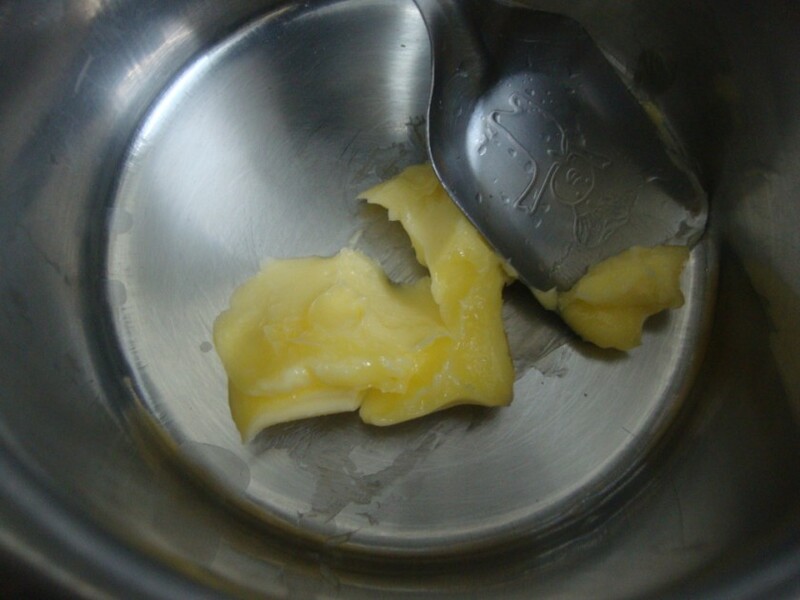 Take the butter in a bowl, cream it well by using a spoon, beat it well till it starts becoming fluffy. 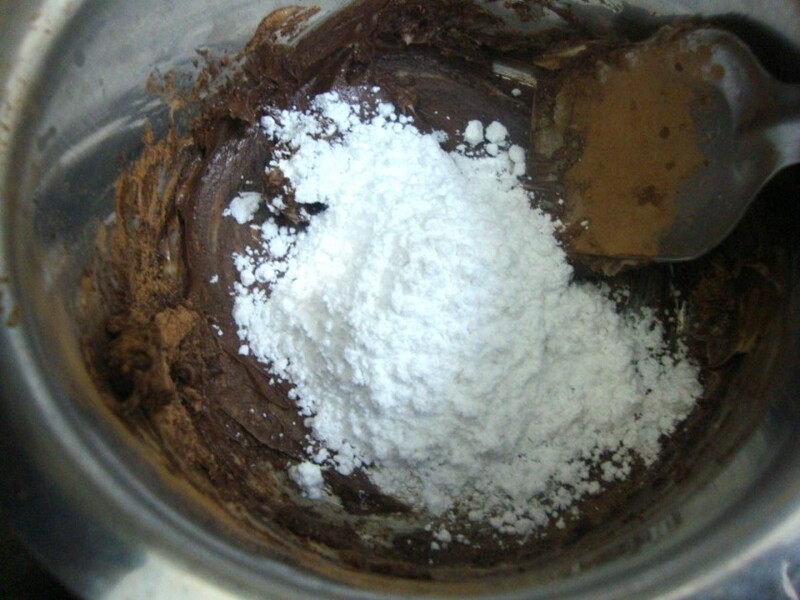 Add the cocoa powder and icing sugar, continue doing it for about 10 mins or till your hands ache! Scoop it down the piping bag and freeze for 10 minutes if required. 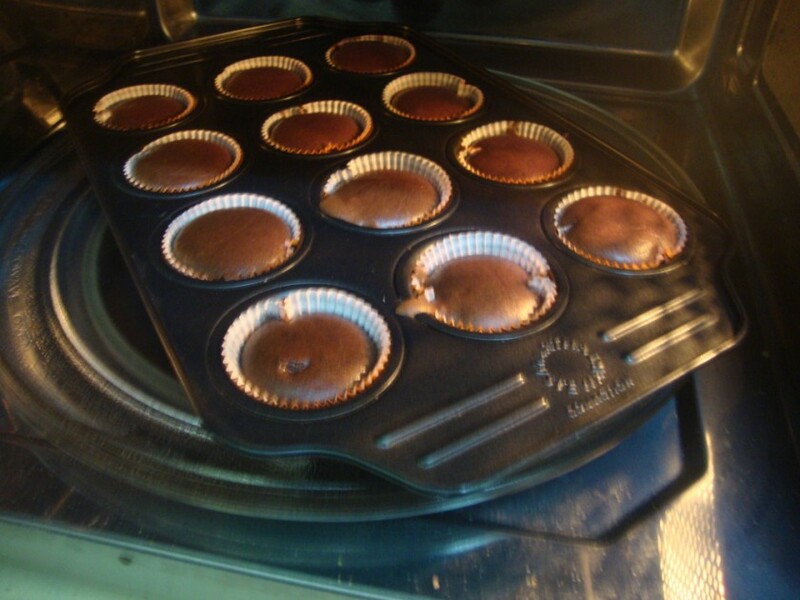 Once the muffins are cooled, decorate the top. It was very moist and crumbly. If you want to bake it without the liners, grease the muffin tray with butter. This recipe doesn’t required to be careful, this was manhandled by a 9 year old and still came out very well. 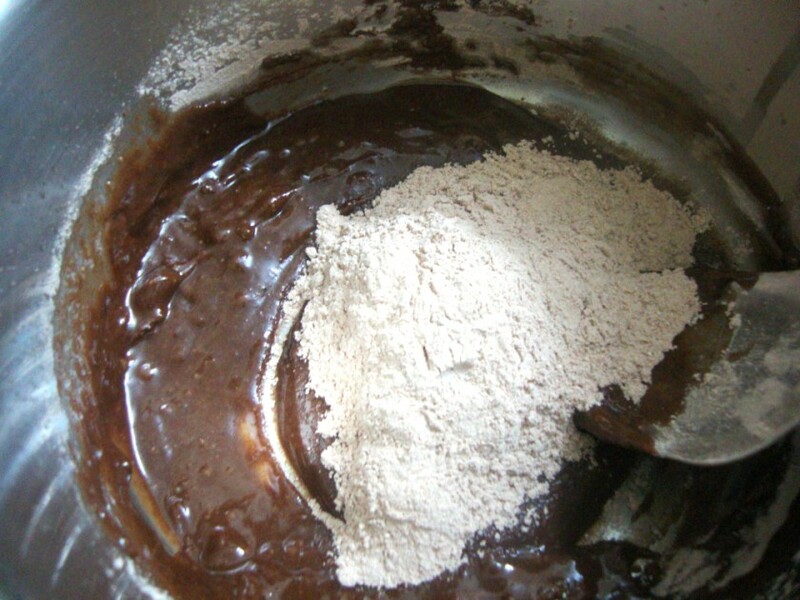 Just make sure the batter doesn’t lump on you, you will then end up breaking the lumps. 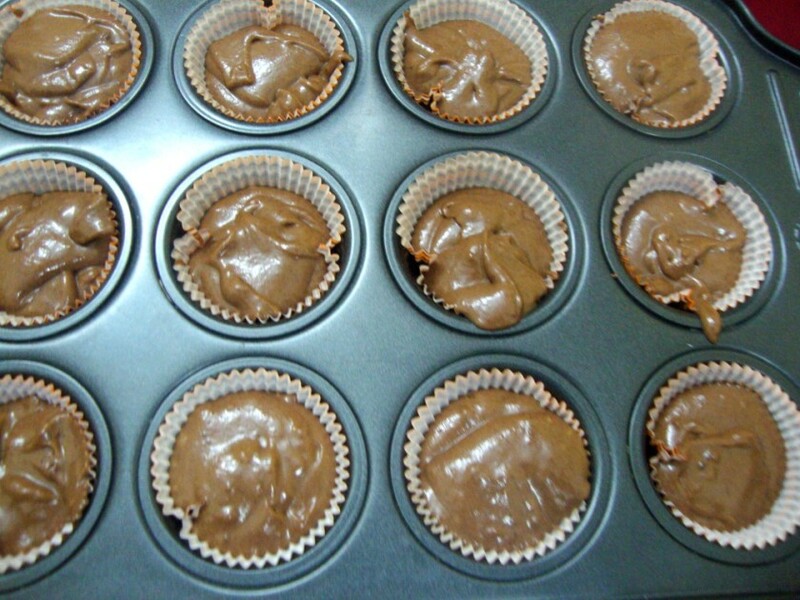 Wait for the muffins to cool down, else the frosting will melt away. The milk I used was sweetened as it was kept for milkshake. 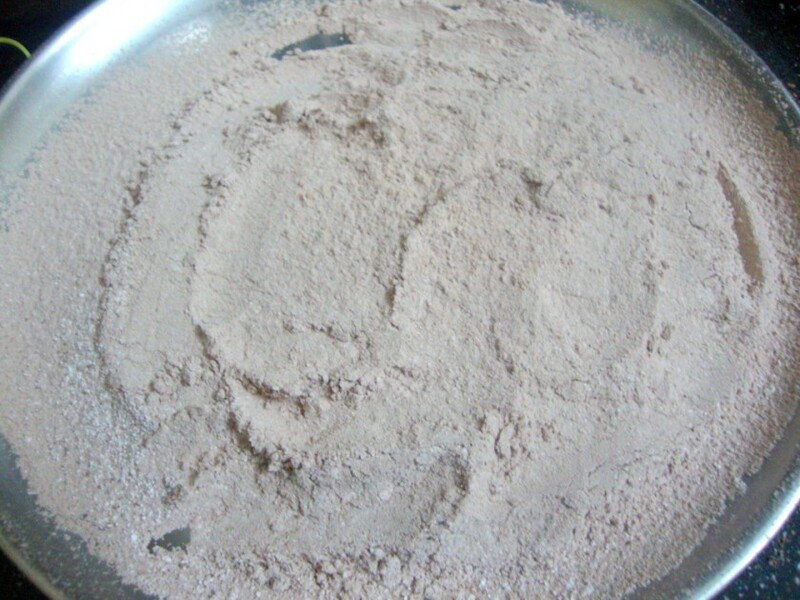 So increase the sugar by tasting the sweetness of the batter. 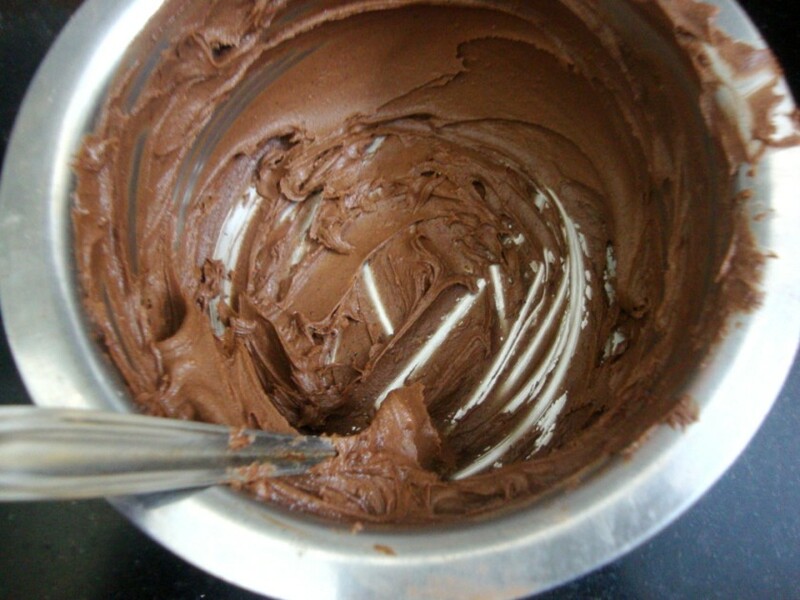 Increase the sweetness in the batter if you are not planning to make the frosting. All the three were eagerly waiting for the muffins to be done. Chinnu wanted the icing and all of them gobbled 1 each right away, went on the second but managed to eat off the frosting and managed to bite more. Konda said she liked the Banana Muffins better. I think she said that because these didn’t have those chocolate chips that I refused to part with. I know by tomorrow nothing will remain. I thoroughly enjoyed these and I can see my diet plans going out for a toss. With the frosting it was divine! 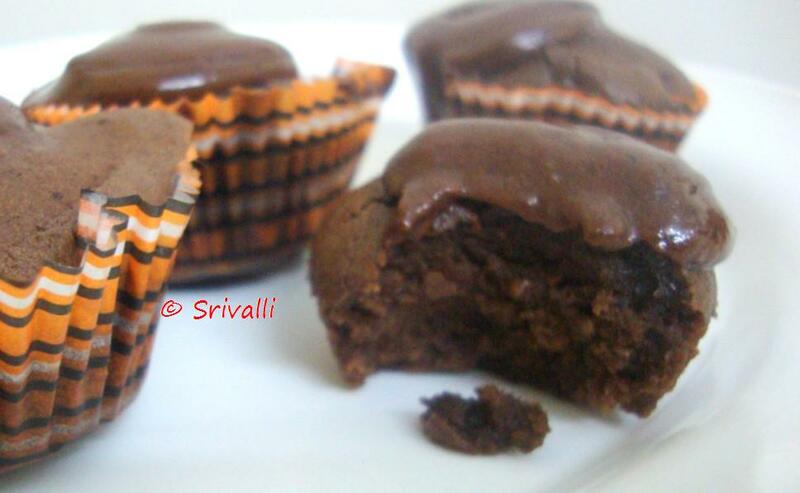 Well I confess, because of these chocolate delights I ended up announcing a Chocolate feast for the Kid’s Delight! It’s on till the 15th of January do send in your favorites. simply amazing, cannot believe all was done in just microwave. am yet to learn how to bake in micro with convection. these look amazing. am bookmaking this for my sonny boy's kiddie friends. Wonderful job Valli… I dont know why I am not getting update in my reader .. came here seeing FB. Everytime this happens. Love that you are baking again! And to save frosting, I don't use the piping bag. Just use those little bags you get milk in, and you can use pretty much all of it! For kid's delight event only chocolate netries allowed rite??? 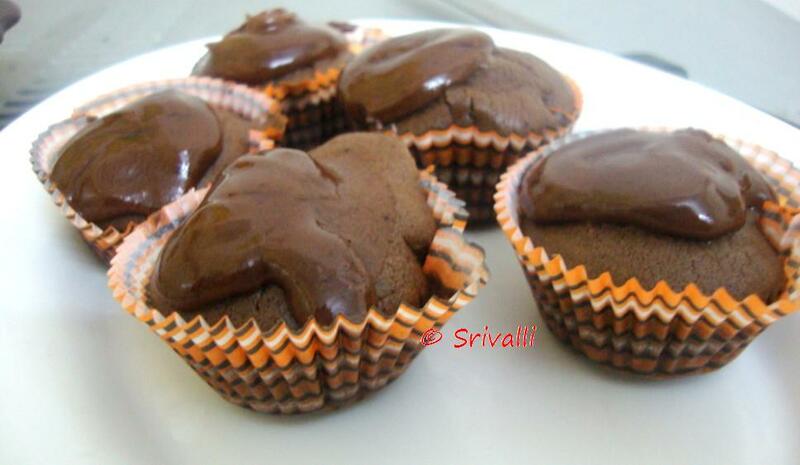 The muffins look chocolaty and delicious, Valli. Like the piping set. Those cupcakes really look yummy. I too end up in similar situations where I lack certain ingredients and then just get started and substitutes just fall in place. I usually like healthy cupcakes especially eggless. And your frosting looks absolutely fantastic. Thank you friends..I am glad you all liked it..My kids loved this so much that I ended up making it again.. It looks so yummy actually I just love the chocolate frosting on top! I should probably try this one on new year's eve. Wow, cup cakes are tempting me a lot! Bookmarking it for my experiments..